Strip back the cards, the memorabilia and the back-room barters and there are still reasons to head over to the Toronto Sportscard and Memorabilia Expo, taking place May 4, 5, 6 at the International Centre near the Pearson Airport. One of the main reasons the Expo has drawn well, despite the number of dealer tables pulling back in recent years, is because of the unique autograph guests that are brought in every year. This year’s roster, for example, includes the likes of Dominik Hasek and Cody Hodgson. Over the years, the price and format of signatures has varied. 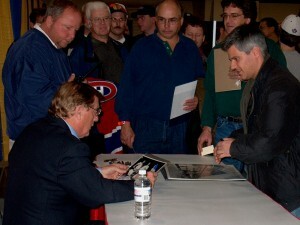 Canada Post, when it was creating stamps of NHL legends, would bring a few personalities out to the Expo to sign their products; other times, a legend like Gordie Howe or personality like Wren Blair would do a book signing; but the true bread and butter of the autograph guest lineup came in the form of the major show autograph guests. And boy howdy, there have been a lot of them. Virtually every major hockey star has taken a turn behind the signature signing table at the Expo. In recent years, this has included the likes of Mario Lemieux and Mark Messier, but it has also included theme groups like Maple Leafs stars or Habs Stanley Cup winners. Many of these signers have also been very gracious with their time as well. Yes, there is generally a time restriction on how long a signer will be there and show organizers plan accordingly; but there is a certain mystique to the Expo that you don’t see at many other shows – you get collectors coming here working on projects or unearthing rare items from decades gone by that are either personal or unique, so much so that the signer can’t help but stop for a moment and reflect on it. So as the Expo draws close, be sure to take the opportunity to line up for a signature. The sales can wait.